The Trump administration has called the biggest action sanctions that the United States has ever taken against Iran. The Iranian President has described this act as an act of "Economic War" and said that his country would win. All the heavy economic sanctions imposed on Iran on Monday by the United States is the most important element of the decision by President Trump last May to abandon the Iranian nuclear deal of 2015, which he called disaster. Sanctions include wide-ranging exceptions that could limit their impact: Iran's biggest oil customers, such as China and India, will not be penalized, at least for six months. Nevertheless, the Iranian oil, maritime and banking industries could suffer heavy losses and its weakened currency could still collapse under the sanctions, which, according to Trump, aims to put an end to what he considers to be actions unacceptable Iran in the Middle East. Iranian President Hassan Rouhani, emboldened by the many critics of Trump's sanctions policy, especially from the United States' closest allies, reacted with defiance on Monday. He said his country would not abide by "the language of force, pressure and threats", and pledged to break the sanctions. While the outcome of the confrontation is not clear, experts on Iran and the sanctions said The Iranian economy, already in difficulty, will certainly feel more pain. "This will make everything considerably harder, if not impossible, in parts of Iran," said Farhad R. Alavi, managing partner of the Akrivis Law Group, a Washington-based company specializing in law. sanctions and export. "Revenues decrease and costs increase." The Trump administration has kept its promise to re-impose the heaviest sanctions on Iran that had been eased or lifted under the nuclear deal negotiated by the United States and other world powers three years ago . The administration has threatened to penalize Iranian oil buyers as part of its stated goal of reducing Iran's oil exports to zero. It has blacklisted 50 Iranian banks and subsidiaries, more than 200 passengers and ships, the Iranian national airline and more than 65 Iranian aircraft. Under such sanctions, the United States may seize assets within their jurisdiction that belong to blacklisted persons and entities. Sanctions also prohibit commercial relations with these persons or entities. The president says that the nuclear deal has not deterred Iran from ultimately acquiring nuclear weapons and wants the restrictions imposed by the agreement to be permanent. He also wants Iran to abandon the development of its ballistic missiles and cease supporting militant groups in Syria, Yemen and elsewhere that the United States considers to be terrorist organizations. The Iranians accused the United States of duplicity and violation of international law for giving up an agreement reached not only with Iran, but also with five other major powers: Britain, China, France , Russia and Germany. All continue to support the agreement, and its validity has been reaffirmed by a United Nations Security Council resolution. 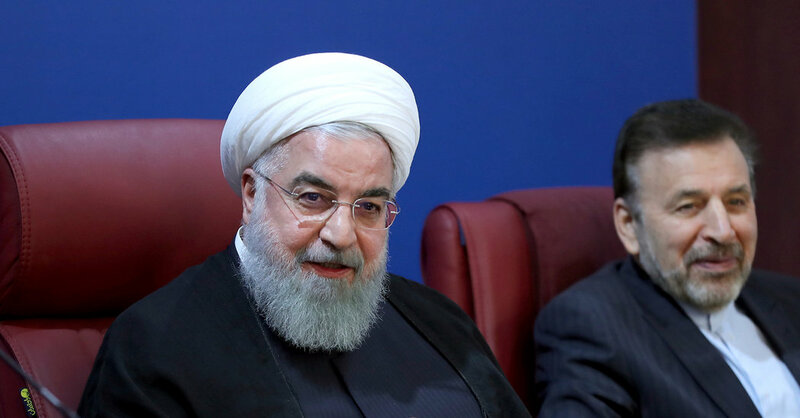 President Rouhani said that his country would "break proudly" the reimposed sanctions and that Iran was engaged in "an economic war" with the United States. Punctuating the message of defiance, the Iranian army tested new missiles as part of its air defense system during an intensive exercise hours after the resumption of sanctions. Iran's Foreign Minister Mohammed Javad Zarif, a critical critic for Trump, said sanctions were being tightened. what he called the growing isolation of the United States. Why did the United States grant exceptions to Iranian oil exports? The Trump administration says it wants to deny Iran oil revenues, the country's main export product, without destabilizing the global market. A total ban on Iranian oil exports could limit supply and soaring prices – a result that Mr Trump regards as politically dangerous. US Secretary of State Mike Pompeo announced Monday that eight major oil importers – China, India, South Korea, Turkey, Italy, Greece, Japan and Taiwan – reprinted their sanctions. would benefit from exceptions or waivers of 180 days allowing them to buy Iranian oil as long as they suffer reductions. More than 20 countries have already reduced their imports of Iranian oil, reducing Iranian exports by about one million barrels a day, Pompeo said. US officials would need powerful leverage to push China and India, Iran's biggest customers, to cut all their imports; both nations have enormous energy needs. Chinese leaders are furious about the intensification of Trump's trade war and are wary of Trump's diplomacy with North Korea over the country's nuclear program. Given all of this, experts say, it is unlikely that China and India will end all Iranian oil imports even after the expiry of the 180-day waivers. "I think the United States has calculated that market stability and geopolitical relations take precedence over interests in order to reduce Iran's exports," said Henry Rome, an Iranian analyst with Eurasia Group, a consulting firm in the US. political risk based in Washington. Have oil penalties affected prices? The global oil market, having foreseen that the Trump administration would grant certain exceptions, has not reacted significantly to this announcement. Brent prices, an international benchmark, changed little on Monday and are in the range of 73 to 74 dollars per barrel. Ellen R. Wald, research fellow at the World Energy Center's Atlantic Council, a Washington-based research group, said at a news briefing about the sanctions that any price increase could be mitigated by additional supplies expected next year other exporters, including the United States. If this happens, she added, the administration "can push countries to further reduce Iranian imports and not to affect US consumers too much." Despite Trump's complaints about the nuclear deal, Britain, France and Germany consider it a success. The International Atomic Energy Agency, the UN's proliferation watchdog, has repeatedly said Iran respects the terms of the agreement. Europeans are therefore angry because the United States is using its huge economic leverage to threaten European companies wishing to do business with Iran. Many of them have abandoned the country. More generally, Europeans fear instability in Iran, which could lead to security problems and migrants, and they fear that the United States will take measures that could destabilize the country. Europeans have sought to establish a alternative payment system with Iran that would bypass US sanctions, allowing them to conduct business without risking sanctions from the United States. But the system has not been developed yet and the Americans have basically ridiculed the idea, warning that they could sabotage the system by simply adding it to their blacklist of sanctions. Despite the Iranian swagger, are his leaders worried? Some speeches by Iranian officials have raised concerns. Farhad Dajpesand, Iran's Minister of Economy, said it was probably the most "sensitive" period for the country since the government was founded after the 1979 Islamic Revolution. Interior Minister Abdul Raza Rahmani Fazli suggested that the recent wave of economic protests in Iran was a daunting task. The demonstrations were motivated in part by the inability of the nuclear deal to bring economic benefits promised by Mr. Rouhani, although corruption and mismanagement were also considered underlying causes. Can the Iranian economy collapse? Perhaps the most critical critics of Iran will say that this is the case, pointing to a sharp decline in the value of the Iranian currency since Trump took office. But many Iranian analysts believe that the impact of sanctions imposed is far from clear. "There is a big difference between crisis and collapse," said Rome. "I think they are on the verge of a crisis. They will have great difficulty in ensuring an adequate supply of food and medicine. But Iran has had serious difficulties in the past. We never saw that they were about to give up. "